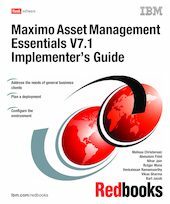 This IBM Redbooks publication is a guide to implementing Maximo Asset Management Essentials. It provides general product information and covers the planning, installation, and initial configuration processes. An entry-level member of the IBM Maximo Asset Management product family, Essentials is ideal for smaller organizations that require a subset of the extensive range of features in the IBM Maximo Asset Management product. With Maximo Asset Management Essentials, smaller organizations can take advantage of proven Maximo Asset Management technology, while enjoying cost savings. Essentials enables smaller organizations and departments to organize, track, and manage their asset and work management processes, and to implement a maintenance regimen based on industry leading technology and best practices. Unlike competing solutions that are unable to grow with an organization, forcing businesses to lose their initial expenditure, Essentials is an integrated solution that enables organizations to build on their Maximo investment by leveraging the Maximo scalable architecture. It helps eliminate paper-based and spreadsheet-based processes and provides custom applications. Essentials can grow with a company so it can manage all asset classes and work tasks from a single, unified platform.